The DALLAPE & SON ACCORDION FACTORY was founded in 1876 in Stradella (near Pavia, Italy) by Mariano Dallapé. Mariano was born in Brusino di Cavedine (in what was at the time part of the Austrian South-Tyrol). At the age of twenty he left the native mountains and came to Italy to seek his fortune, like many others in those days. He got a job in Genoa as a stoker working with explosives during the works of enlargement of the port, until the premature explosion of a bomb left him lame. Sadly he was declared unfit to work and had no choice but to go back to his native Trentino. Luckily he had with him an old and rudimentary Austrian accordion that he was very skilled at playing, and that enabled him to make some money and find shelter on the way by playing in farm-yards and inns. When he reached Stradella, some internal metal parts got broken and the accordion went completely flat. Mariano was not discouraged and went to work to fix it. He managed to do it so well that the result was almost a brand new accordion, a more precise instrument that produced sharper sounds. A miracle! But he wasn't satisfied, and decided to put into practice some ideas that the repair and his musical talent had suggested to him. He went on to design a whole new instrument with a richness of sound that far exceeded that of the Austrian accordion, which was no more than a rudimentary instrument for accompaniment. The result was sensational, and his achievements have been since then universally recognised. 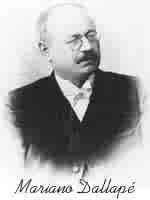 The following is an extract from the Italian Music Encyclopaedia, under the entry "ACCORDION": "...the key figure who managed, through a series of brilliant innovations, to change the archaic accordion into the more complete and complex diatonic accordion, was born in Trentino and resided in Stradella. His name was MARIANO DALLAPE'". The company has always belonged to the Dallapé family. Mariano was succeeded by his son Onorato, who showed signs of the same talent but died the same year as his father (1928). The business was then taken over by Giuseppe, the son of Mariano's brother, who contributed to preserve and augment the prestige of the brand name. Since 1969 the company has been directed by his three sons Mariano, Amleto and Fabio. Amleto acts today as managing director.